What do our customers have to say about Pumpernickel's ? "Two thumbs up from all of us at Bamberger! The presentation was beautiful, and everyone raved at the great selection of healthy items we had. All the items were fabulous, especially the salmon nicoise & grilled chicken. We are very impressed at the high quality food and really great service we’ve received from your team. You’ve definitely got a regular customer!" "Usually I just order the food but today I actually tried one of the grilled baguette sandwiches……loved it. It was extremely tasty and fresh. I loved the combination of the grilled onions and Brie served with the crispy baguette. They are really good quality sandwiches. Some of the invited guests come up to me after the meeting and ask me where I ordered the food." "The food from Pumpernickel’s was thoroughly enjoyed by all. The quality and presentation were excellent, and we really appreciated that you labelled the meat types for the sandwiches. The falafel platter, salad, and dessert tray were huge hits and we look forward to enjoying your catering again in the future. Our compliments to the chefs and all the staff involved with processing, preparing, and delivering our order." "The catering was amazing, and the quantity was more than expected. It was delivered before the expected time and set up perfectly. Everyone enjoyed their breakfasts." "The soup was a hit (especially already being hot) as was the food, but the highlight of the day was by far the chicken. Everyone raved about it. Thanks for making it a smooth catering experience. We will definitely be ordering again from your company." "The wraps were delicious and with the variety of the assorted platter, we were able to satisfy every taste. 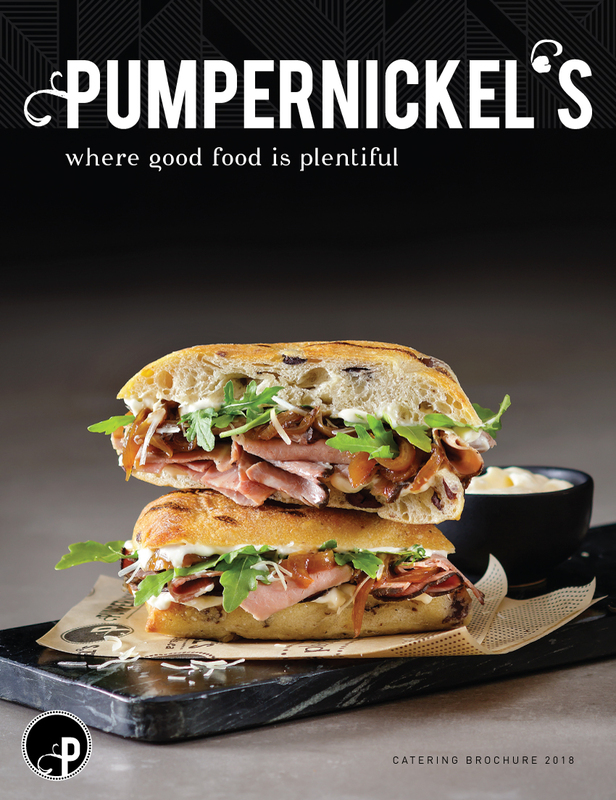 We definitely will give Pumpernickel a call if we need catering in the future." "The Pesto Capellini was the best I've ever eaten and the desserts were to die for! We will definitely be ordering from you again." "I received rave reviews from my executive team on breakfast and lunch. This was the first time the team had lox and bagels for breakfast - it went [right] out of the box. One by one they were out of their chairs and with their fingers they started to sample items. They devoured almost everything. This is truly a great sign!" "I really want to recognize the customer service I receive every time I place an order. Pumpernickel’s customer service has always been above-and-beyond. Response times are always very quick and they make my life a lot easier. This is the reason why I rely on Pumpernickel’s all the time."